Charlotte, NC, Feb 23, 2010 — The national, Charlotte-based Campus Pride (www.campuspride.org) and local Time Out Youth (www.timeoutyouth.org) have partnered for a joint fundraising event on Thursday, Feb 25 to bring attention to lesbian, gay, bisexual, transgender (LGBT) and ally youth in the Charlotte area. The fundraiser will take place at 6 p.m. at Myers Park Baptist Church (1900 Queens Road) and then continue at 8 p.m. at Petra’s Piano Bar (1919 Commonwealth Avenue). No tickets are necessary; however, donations are encouraged. Everyone is welcome. Titled “Believe In Youth,” the event will feature civil rights leader and author Mitchell Gold and his book “CRISIS: 40 Stories Revealing the Personal, Social and Religious Pain and Trauma of Growing Up Gay In America.” A resident of Hickory, NC, Gold is a nationally recognized leader in the furniture industry as well as the founder of Faith In America, a national nonprofit dedicated to raising awareness of the harm caused to LGBT Americans by religion-based bigotry and prejudice. In addition to Gold speaking at Myers Park Baptist Church at 6 p.m., the event continues at Petras Piano Bar at 8 p.m. featuring Gold and two contributors to his book Rev. Reggie Longcrier of Hickory, N.C. and Matt Comer of Charlotte, NC. Rev. Reggie Longcrier founded Exodus Missionary Outreach Church in 1997 as a unique non-denominational multi-ethnic ministry whose doors are open to all people regardless of race, socioeconomic background, history of personal struggles, and sexual orientation. Then in 1998, Longcrier founded Exodus Homes, a faith-based United Way agency, offering transitional and permanent supportive housing for homeless recovering people returning to the community from substance abuse treatment programs and prison. Both his church and nonprofit agency operate under the premise that the dignity and worth of every individual should be cherished. A native of Winston-Salem, N.C., Matt Comer became involved in LGBT advocacy while in high school and represents a LGBT youth voice often unheard. Comer has since worked with Soulforce on several campaigns including the 2007 Equality Ride. He now makes his home in Charlotte,where he is employed as the editor of Q-Notes, the LGBT newspaper of North and South Carolina. Comer’s story in CRISIS addresses his experience growing up as a gay youth in a conservative Baptist church and his personal experience with religion-based hostility and prejudice. “Campus Pride and Time Out Youth partnered to shed light on the ‘crisis’ that LGBT youth face growing up — whether at home, at church, at school or college or in our local community. We owe every young person the right to grow up free of bias and hate,” Steve Bentley, Executive Director of Time Out Youth said. This past December, both Time Out Youth and Campus Pride issued a joint release condemning the remarks of Mecklenburg County Commissioner Bill James when he insulted a fellow commissioner during a council meeting by referring to her deceased gay son as a “homo.” The joint fundraiser hopes to not only raise contributions for both Campus Pride and Time Out Youth but also heighten awareness of the harassment and harms faced by youth who are closeted, coming out or questioning their sexuality. “The Charlotte area has come a long way, but we have much further to go on LGBT issues, especially for youth. Actions speak louder than words – and we need more action to truly be a ‘safe and welcoming’ place for LGBT youth and families,” Shane Windmeyer, Executive Director of Campus Pride. 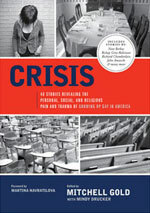 Published in September 2008, CRISIS’ message has been shared with millions through media interviews, special events and book distributions. It presents personal stories of rejection within families, religious institutions, schools and the workplace and calls for understanding and compassion. The book has been distributed across the country to families, educators, clergy and elected officials – including President Barack Obama and Vice President Joe Biden. LocallyTime Out Youth distributed in January nearly 200 copies of the book CRISIS, donated by Gold and Faith In America, to area school guidance counselors in Mecklenburg County. For further information or to become a sponsor of this event, please call Campus Pride at 704-277-6710 or Time Out Youth at 704-344-8335. To make a donation or learn more about Campus Pride, please visit www.campuspride.org. To make a donation or learn more about Time Out Youth, please visit www.timeoutyouth.org.